Updates to Dennise's profile since your last visit are highlighted in yellow. Was in our class at Roosevelt, but graduated from another Yonkers high school. Dennise Murphy Johnson posted a message. Dennise Murphy Johnson has left an In Memory comment for Martin Gainey. So sorry to hear. I remember him well. May he rest in peace. Dennise Murphy Johnson has left an In Memory comment for Joan Clewner. I remember Joan from Jr. high. We were friendly and I guess lost touch. I am very sorry to hear this. She was a very sweet girl and I enjoyed our time as friends. Rest in peace Joan. Dennise Murphy Johnson changed her profile picture. Dennise Murphy Johnson posted a message. New comment added. Hi Dana, Nice to see you. I remember you well. Hope you are happy and healthy. 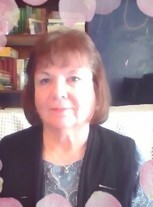 Dennise Murphy Johnson updated her profile. View. Dennise Murphy Johnson added a photo to her profile gallery. New comment added. Dennise Murphy Johnson has left an In Memory comment for Tom Bonanno. Hi Linda, I was so happy to see you here. I tried to post a comment several times but was having computer issues. I have such wonderful memories of the times we spent together. I think of you often. Dennise Murphy Johnson has left an In Memory comment for Marsha Blaustein Neuringer. I was very sorry to hear of Marsha's passing. My thoughts and prayers to out to all. Dennise Murphy Johnson has left an In Memory comment for Leslie Blaustein Greenberg. Hi Ernestine, Great to see you! Don't know if you remember me. Hope all is well. Hi Kathy, Nice to see you. Do you remember me? I lived a little closer to the library on Pennsylvania Ave.
Dennise Murphy Johnson added a comment on her Profile. New comment added.